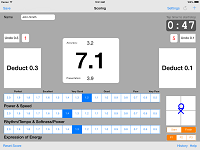 iPad based scoring system for WTF poomsae competitions based on iPad and web technology. Use your iPad for scoring Taekwondo poomsae. Display combined iPad judge scores and manage a court. Available from shop.